Hello, WeR fans!! 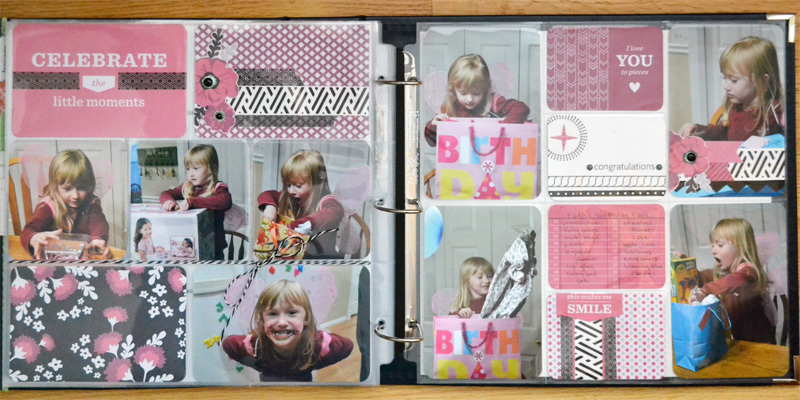 Nicole Harper here to share a few quick ideas on how I use the Albums Made Easy system in different ways…I really can’t speak highly enough of the We R quality and designs!! I started with the We R page protector that has (4) 4×6 pockets and (3) 4×4 pockets. That top right card jumped out at me from the Memo card set, so I just added some gold spray ink and several of the brand new Enamel Shapes from WeR. LOVE the variety of shapes/colors/sizes all in one package!! On the green card with the journal lines, I wanted an added bit of color…so I trimmed one of the other cards in the set to fit along the bottom and added some detail between the two with stitching. The star was punched from some of the We R 12×12 Washi Sheets, and I really like the subtlety of the Washi layered on top of the card. The die cut card sets are an added bonus to each line, but I didn’t need one that was 4×6. I trimmed it down to 4×4 to fit the pocket and felt like it still needed ‘something’. 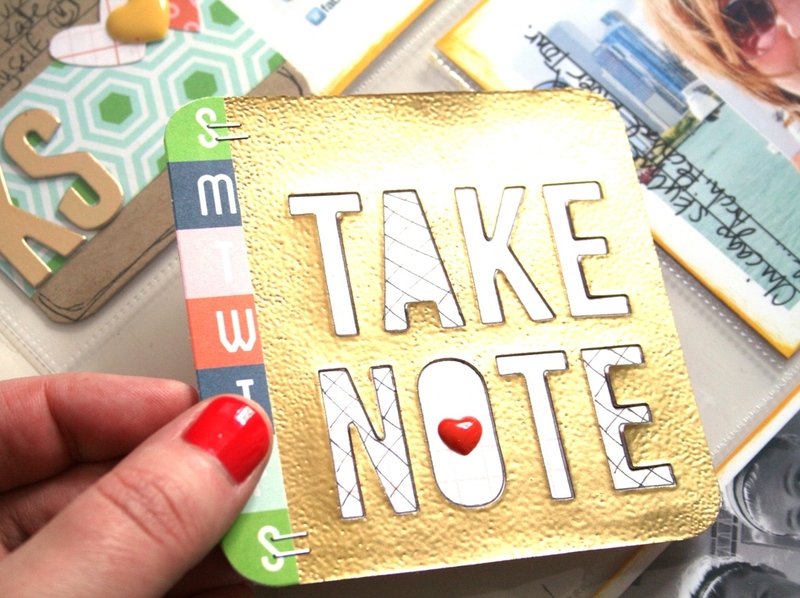 After stamping a VersaMark ink pad all over the ‘take note’ card and then sprinkling gold embossing powder on top, it ended up being just perfect. Again, one more reminder to not be afraid to switch the cards up to work for the specific project you are working on. Thanks to WeR for having me as a guest today…stay tuned for more ideas/projects using the Albums Made Easy products!! 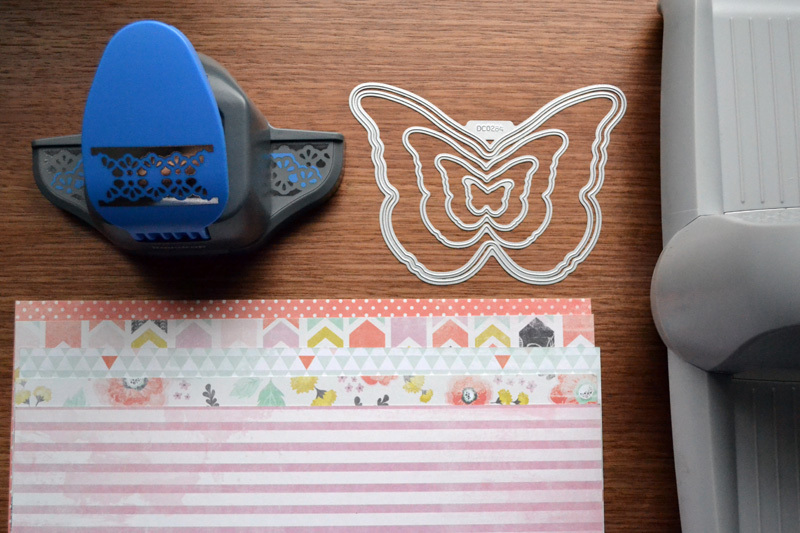 I know I’ve said it before, but I just love washi tape! 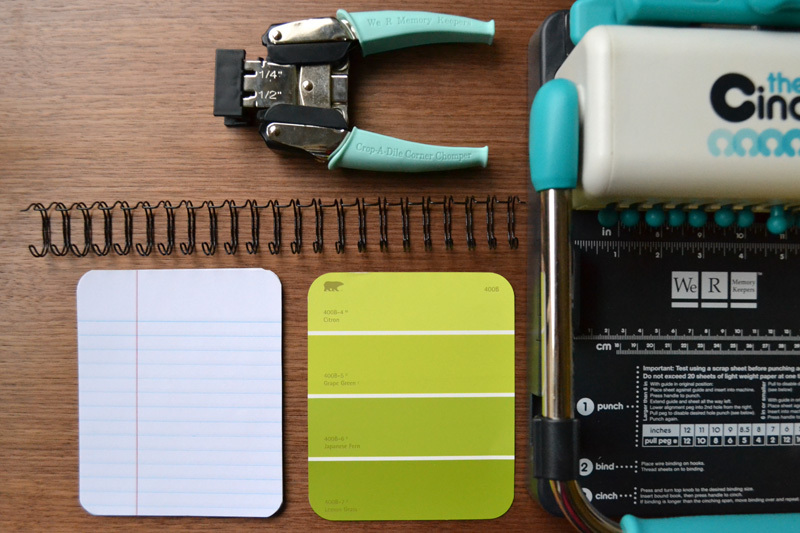 It’s so versatile, easy to use, and looks so cool on projects. 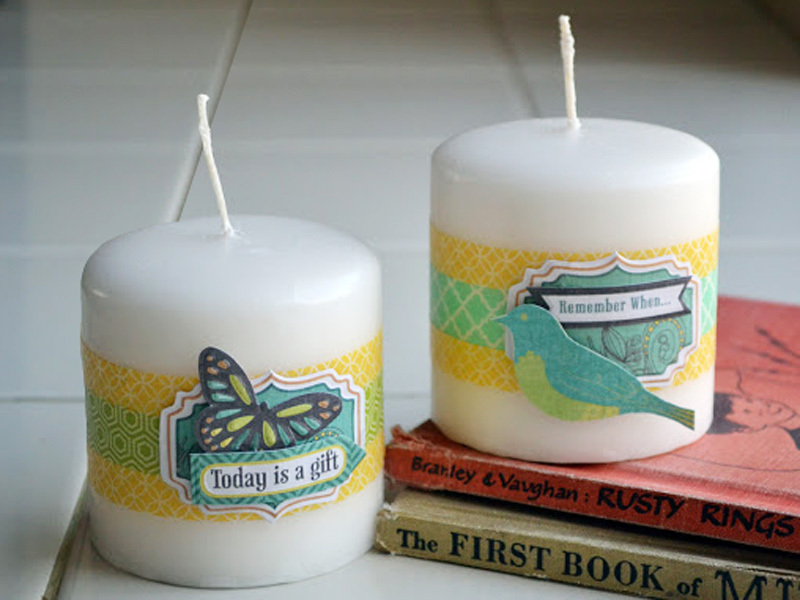 I combined some Washi Tape with a few simple embellishments to create these unique candles. 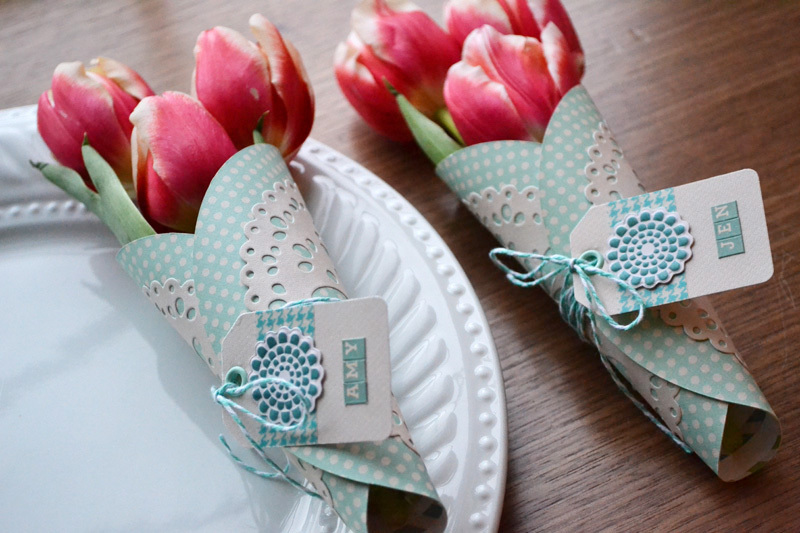 They make great gifts or favors for a shower, luncheon, or tea party. 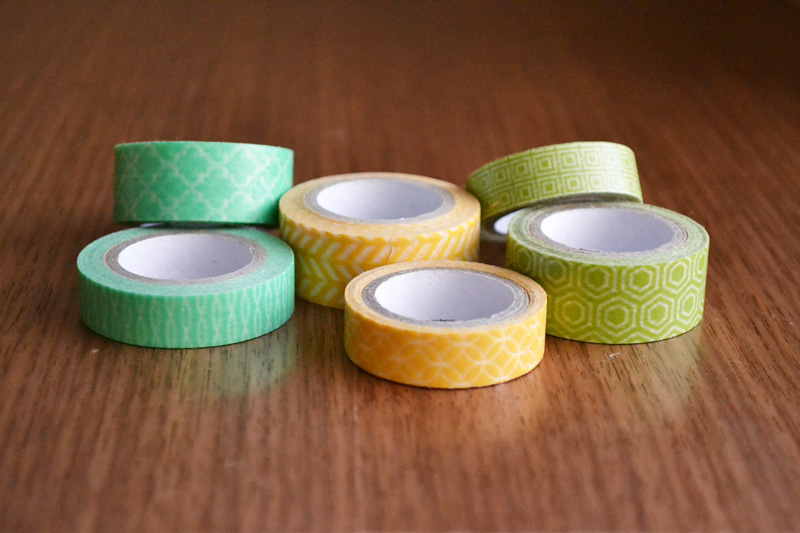 The flexible nature of washi tape lends itself perfectly to round or curved projects–no worries about whether or not it will hold its shape! And We R washi tape comes is so many gorgeous colors and trendy geo patterns that you’re sure to find something that works with your project. 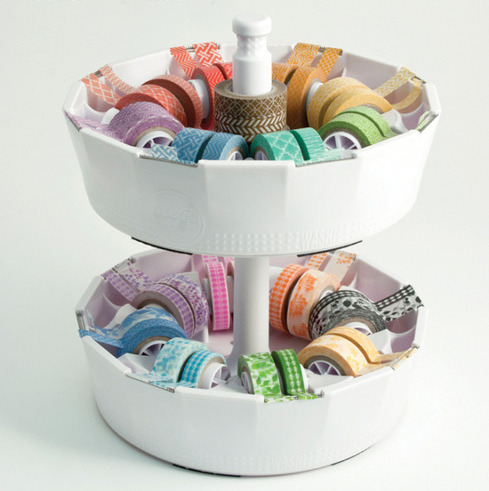 And, if you’re like me and have a fetish for washi tape, never fear…the Washi Dispenser with Stackable Post is here! The washi dispenser with the new stackable post (now in stores) is the perfect way to store and organize all of your favorite rolls of washi tape. 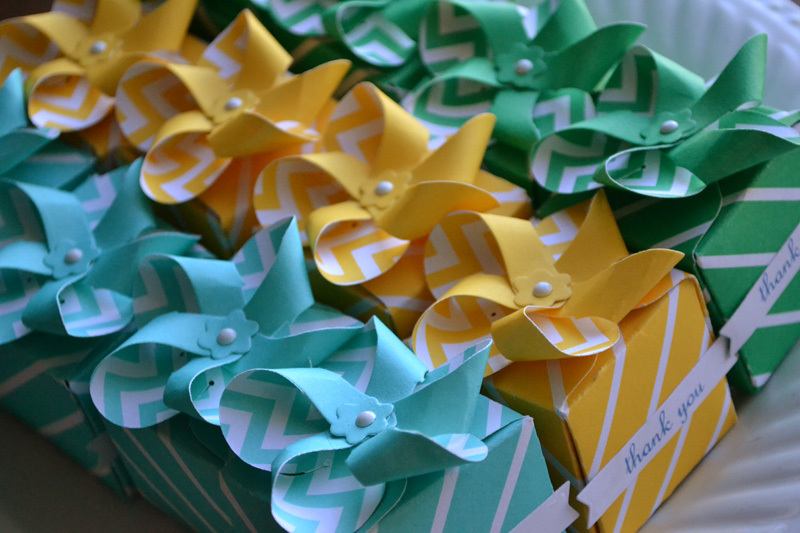 If you’re looking for a cute and unique idea for favor boxes, try using a pinwheel instead of a bow on your gift box. 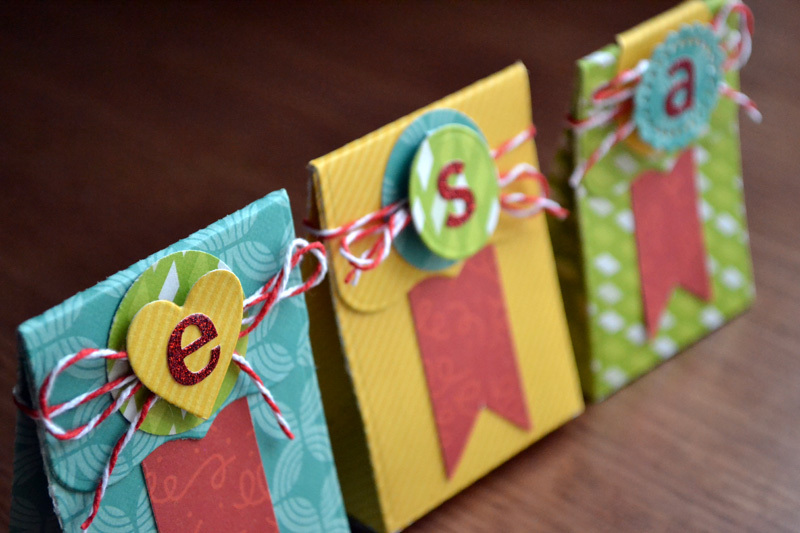 It still has a festive feel, but will set your favor boxes apart and make your party decor a bit more memorable. 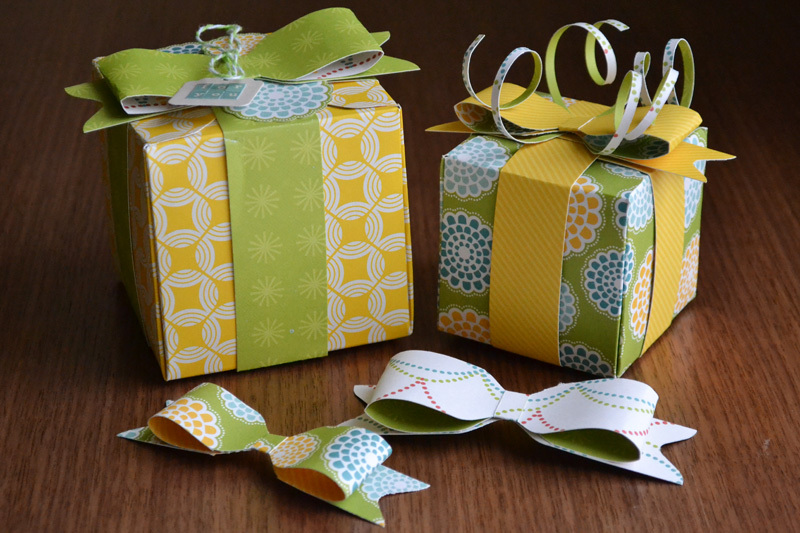 Using the Lifestyle Crafts Flower Pinwheel Template Die helped make these favor boxes quick and easy. 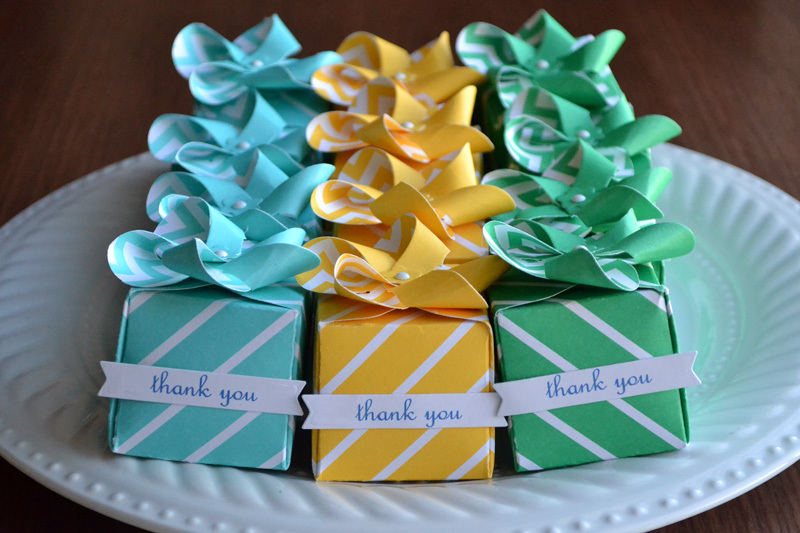 I added them to some small gift boxes I made with the Gift Box Punch Board and some Basics papers in spring colors. 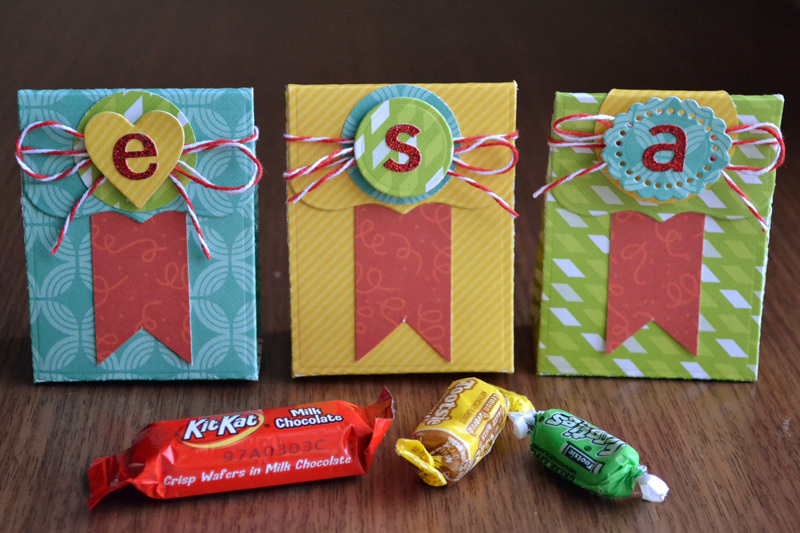 I also used the mini banner die from the Drink Sleeve Template Die set to make the labels on the boxes. You can also use these pinwheels for other party decor–banners, garlands, cake/cupcake toppers, or drink picks. 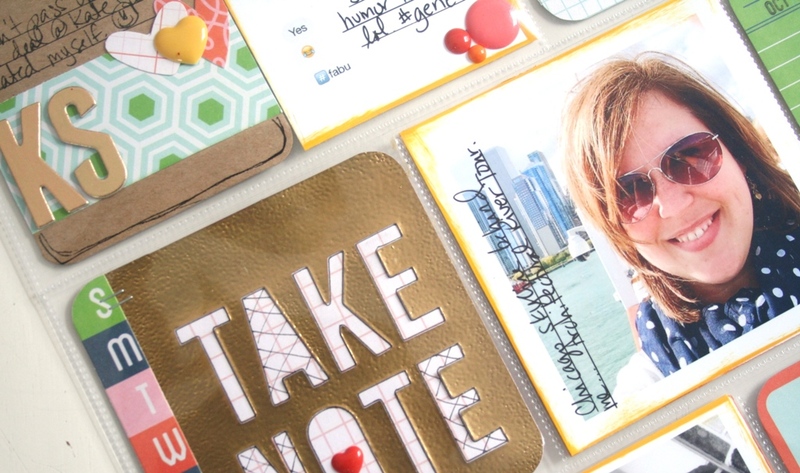 They even look fabulous on cards and scrapbook pages! 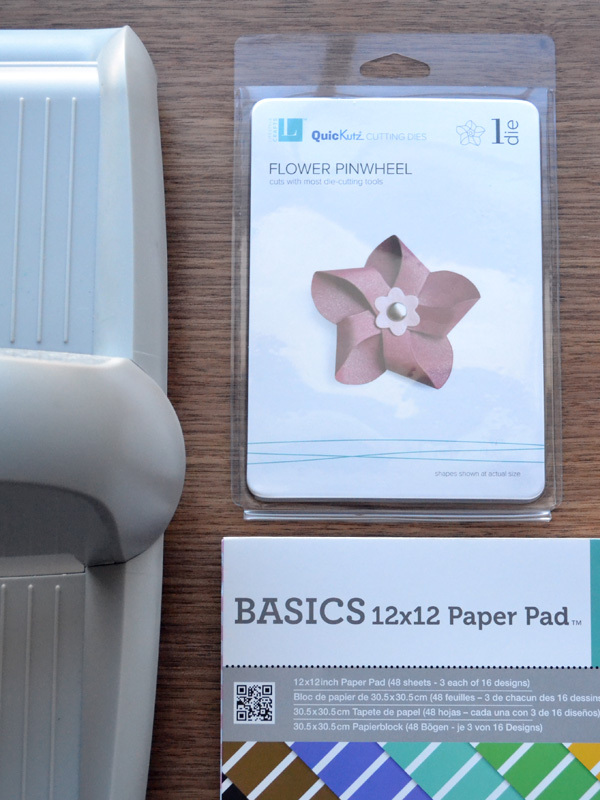 Did you know that you can make more than just envelopes with the Envelope Punch Board? 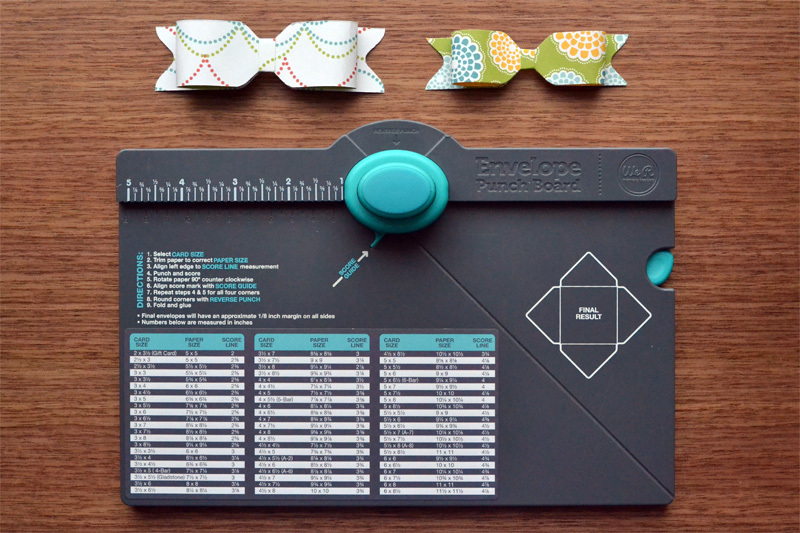 Check out the darling paper bows I made using my Envelope Punch Board and some fun patterned papers from the Hip Hip Hooray collection. You can add these little cuties onto gift boxes, bags, treat containers, cards, scrapbook pages, or decor pieces. 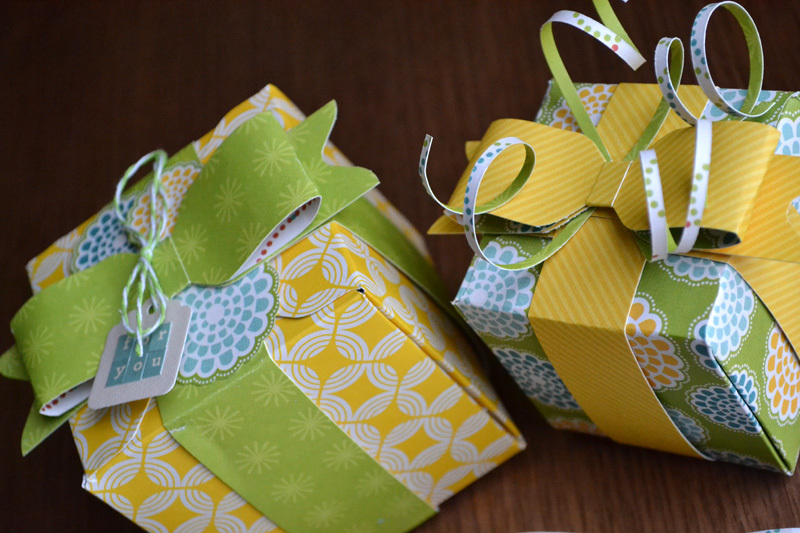 Take a look at the video below to learn how to make these quick, easy, and darling little bows. Now that spring is on its way, I’m starting to think about outdoor parties and entertaining. My daughters love to have “girl parties” and I thought it would be fun to plan a butterfly tea party this spring for them and their favorite friends. 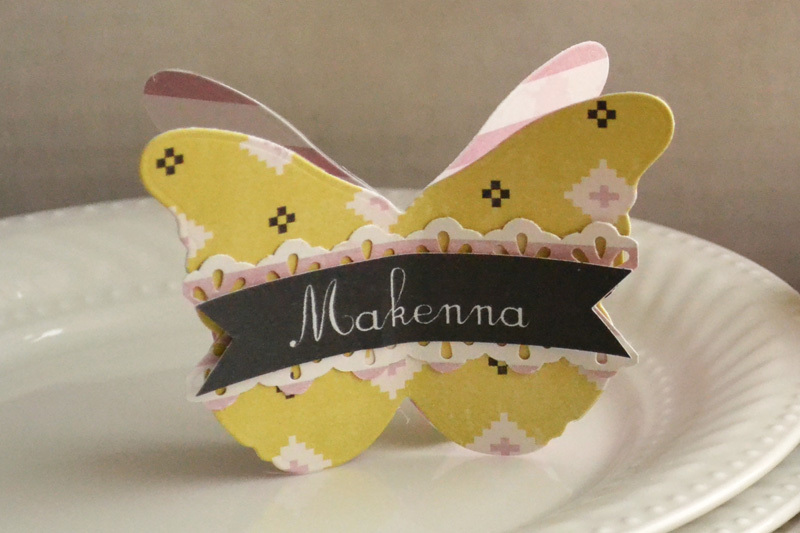 It was easy to create invitations, place cards, and decor with the Butterfly Nesting Dies and a few more of my favorite We R products. Take a look! I created the paper chain by punching several borders with my Raindrop 2 Edge Punch and some patterned paper from the Chalkboard collection. I added a few tiny butterflies that I die cut here and there. 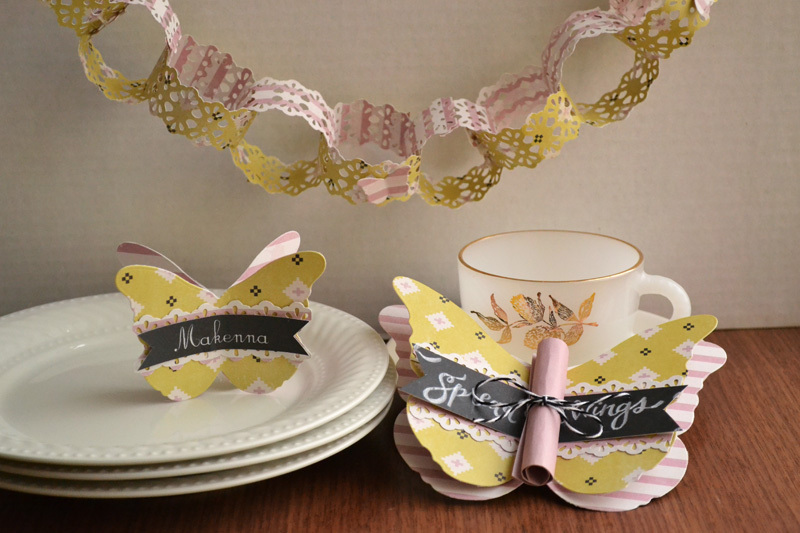 I made the place card by die cutting two medium butterflies from coordinating patterned papers, adding a reverse-print name backed with a punched border, and then bending the wings of each layer forward and backward respectively so it stands on the plates. 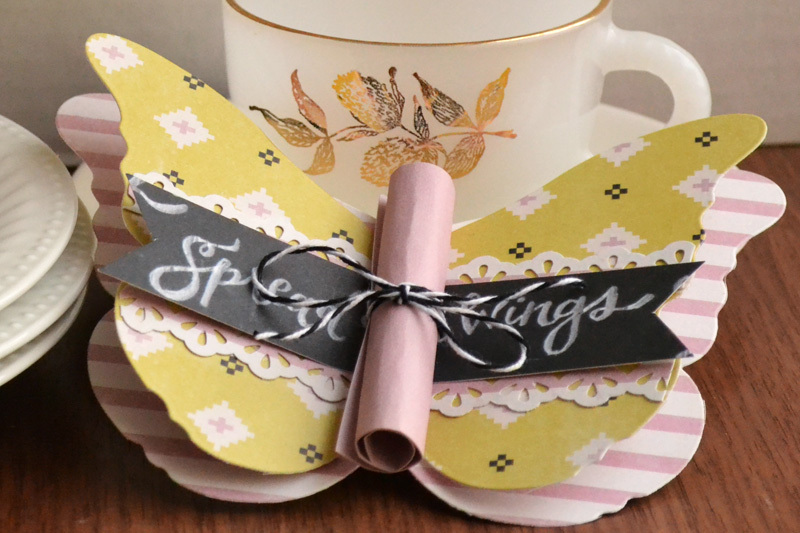 The invitation was made using the two largest dies, a banner strip backed with a punched border, and the tea party details are rolled up in the scroll that acts as the body of the butterfly. How fun is that? I think my girls will and their friends will love it! Oscar night is something I look forward to. Sure the awards are great, but what I love more than awards is an excuse to get together with my friends and family for an Oscar Night Party! 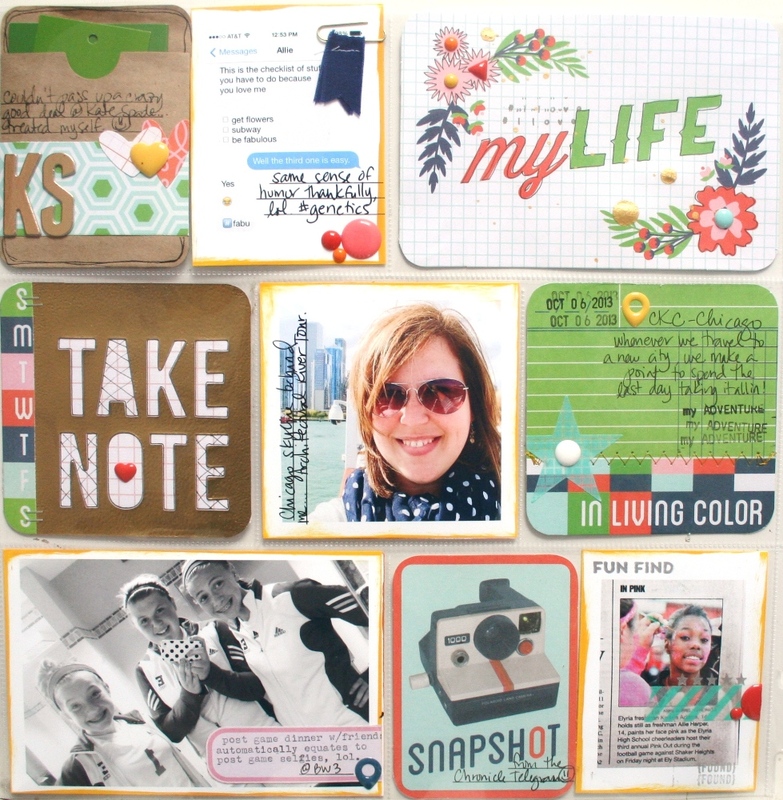 I loved this project from Make Life Lovely blog. 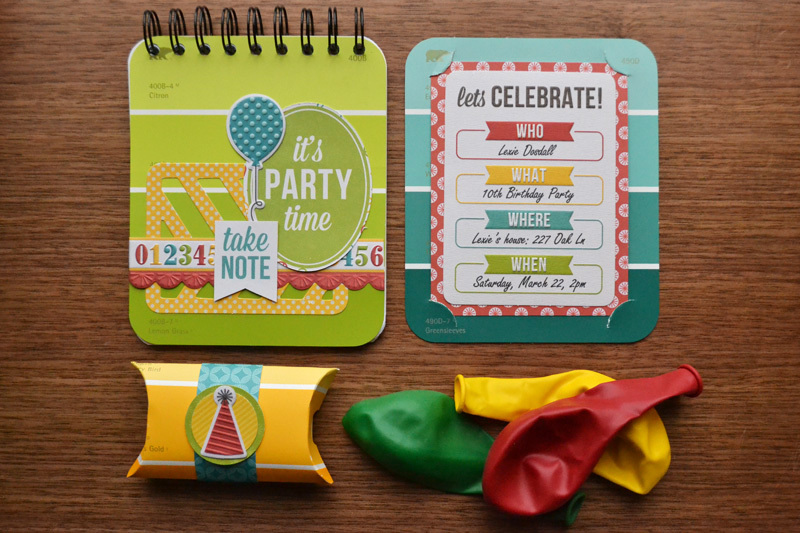 She used We R’s Envelope Punch Board to create glittery invites to the party. 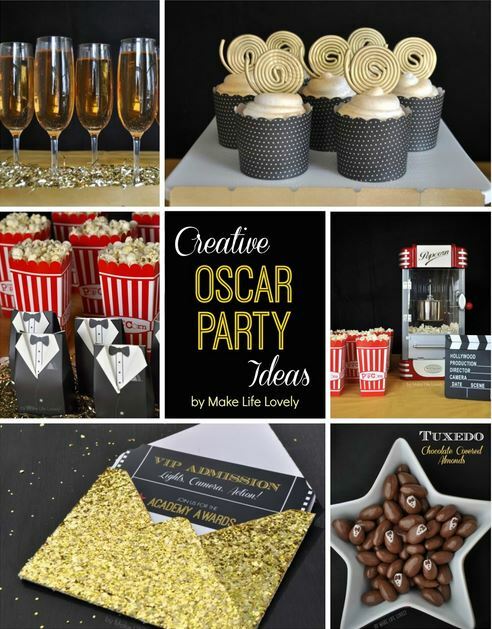 Check out her blog post to see her Creative Oscar Party Ideas. And then get started on your Oscar party. The template die is about 6×8 inches, so I trimmed my 12×12 paper in half and ran it through my Evolution with the die. The bag die also includes three small shape dies that can be used as accents or labels, so I cut some of those with my scraps and included them on my favor bags. I finished off my favor bags with a banner flag, some Baker’s Twine, and a monogram with the recipients’ initials. These 2 1/2 x 3 inch bags are the perfect size for some stickers, small toys, erasers, or small candies. The weather’s warmed up in our neck of the woods, so I’ve been thinking about spring projects. 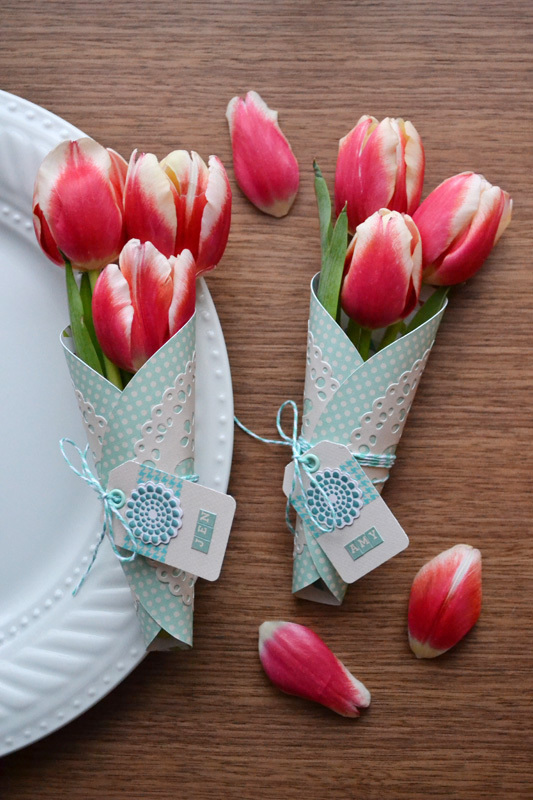 I saw these tulips at the store and thought they would make some pretty favors for a luncheon, tea party, or bridal shower wrapped in patterned paper and doilies. 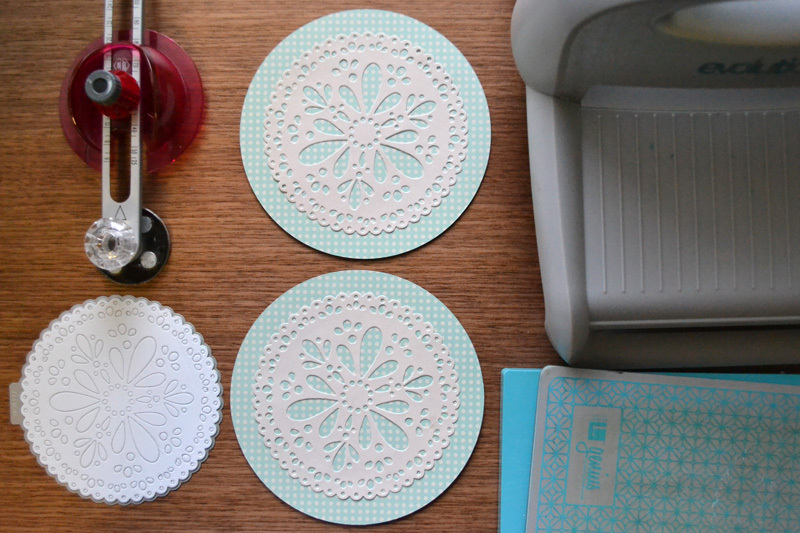 I cut 6 inch circles from Hip Hip Hooray Wish patterned paper using my Magnetic Circle Cutter. Then I die cut some doilies from Hip Hip Hooray Frosting textured cardstock using the Classic Doily Shape Die and my Evolution. I glued them together, tied some Baker’s Twine around the centers, and added tags with the recipients’ names and a few accents. Simple and lovely. Using paint chips (or swatches) in crafting is all the rage right now–Pinterest is full of craft ideas to use up your leftovers. 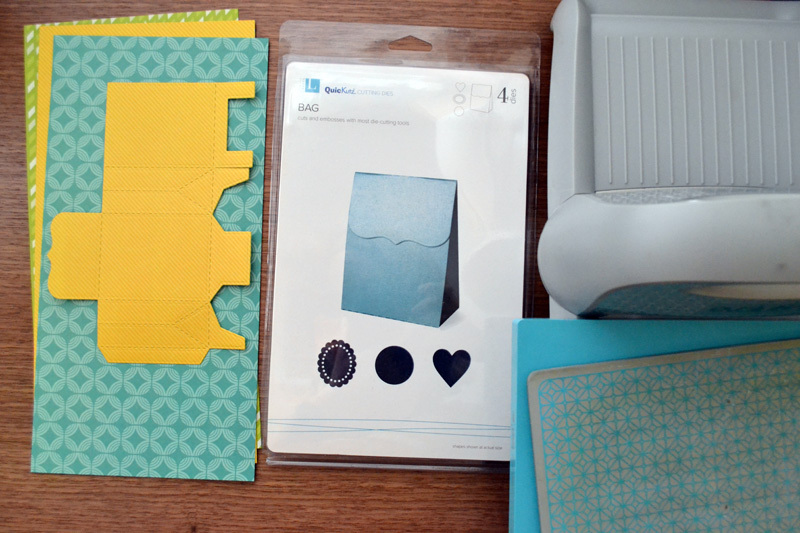 So, today I thought it would be fun to share some ways to combine paint chips with your favorite We R products to create some cool party crafts. 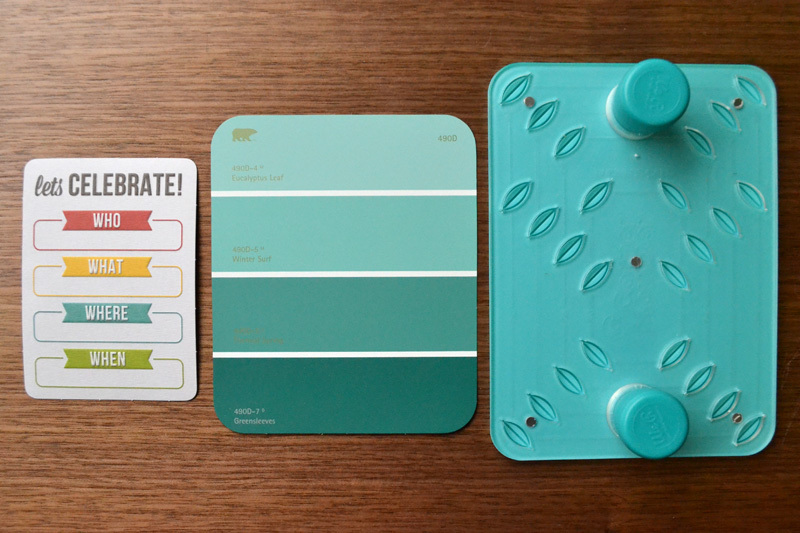 First, I created a paint chip favor box using the Pillow Box Punch Board. 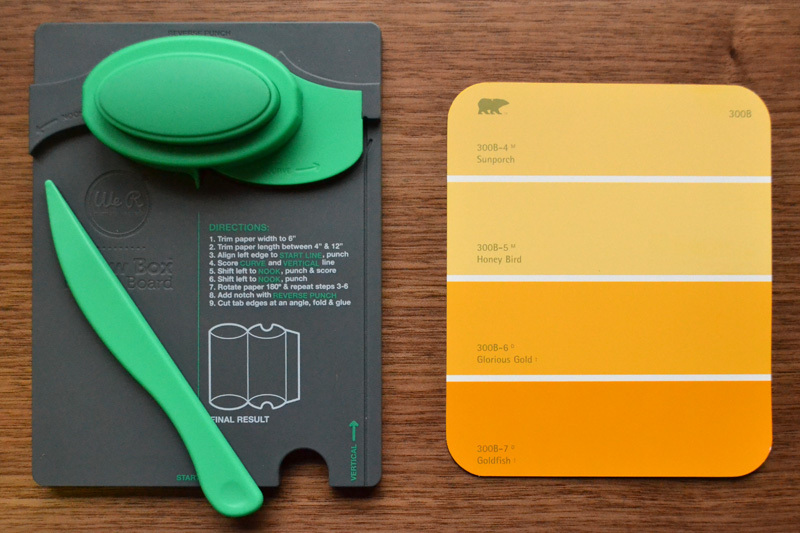 The paint chips I have from Behr are the perfect size (5″x6″) for the pillow box punch board. 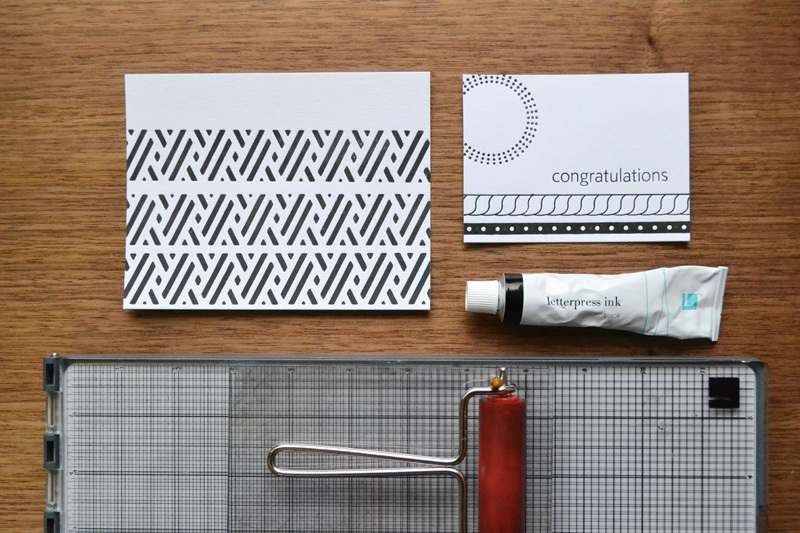 I added a band of patterned paper, and an embossed sticker from the Hip Hip Hooray collection. Next, I used a paint chip as the background for a party invitation. 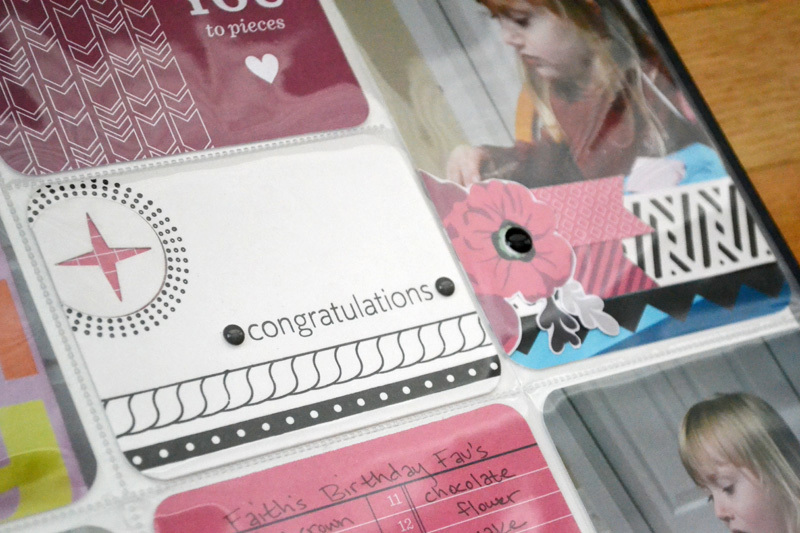 I used the Corner Mounter to punch corners to hold my invite, and used the Celebrate tag frame from the Hip Hip Hooray collection as my invitation. Finally, I created a party planner notebook with my paint chips. I trimmed some loose leaf lined paper to 5×6 inches, rounded the corners with my 1/2-1/4 inch Corner Chomper, and bound them all together with The Cinch. 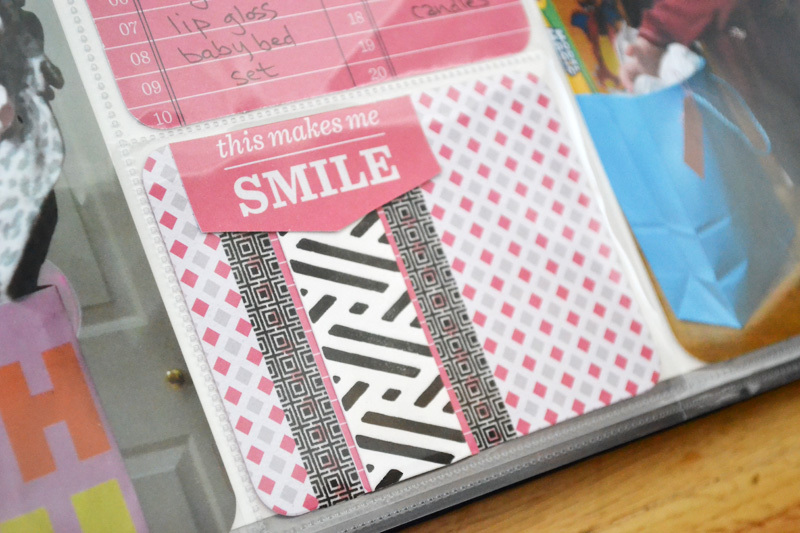 I decorated the planner cover with some Hip Hip Hooray stickers and journaling cards. I hope these projects inspired you to find unique ways to use your favorite We R tools in your crafting. Creative cheers! Today I’d like to share some ideas with you for using the Lifestyle Crafts Letterpress Tool on your Albums Made Easy layouts. Take a look at the layout I made about my daughter’s birthday party. Can you spot the letterpress elements? Here’s how I incorporated some fun letterpress designs into this layout. First I picked out some patterns from the Nautical Printing Plate Set that I thought would coordinate well with the Captured Journaling Cards I used. Then I ran them through my letterpress tool with some Black Ink. I created one 3×4 horizontal journaling card with the letterpress by cutting down an A2 White Flat Card, rounding the corners, punching a sparkle shape and backing it with patterned paper. I also added some grey Enamel Dots to emphasize the word “congratulations” on the outside of my Photo Sleeve so the pocket would lay flat. I also used the letterpress to create some borders for my journaling cards and photos. After printing them I trimmed them and added them to various pockets on my layout. 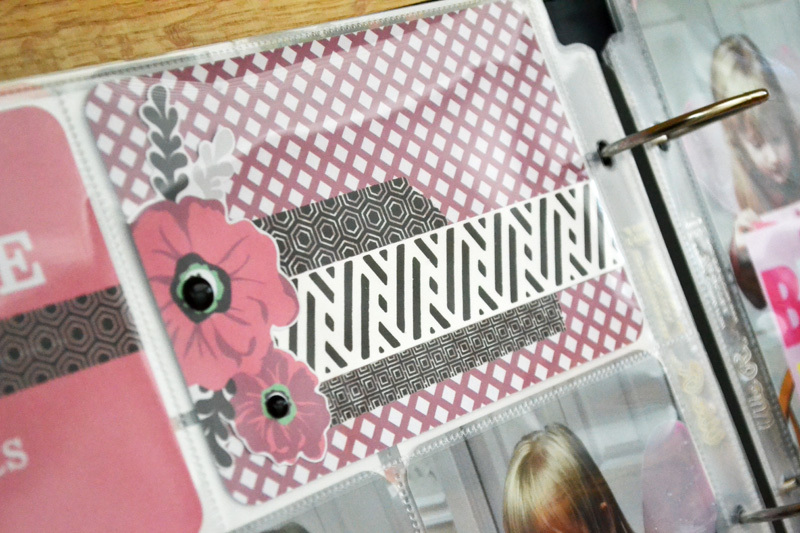 The designs on the printing plates coordinate so well with the Albums Made Easy Journaling Card designs. 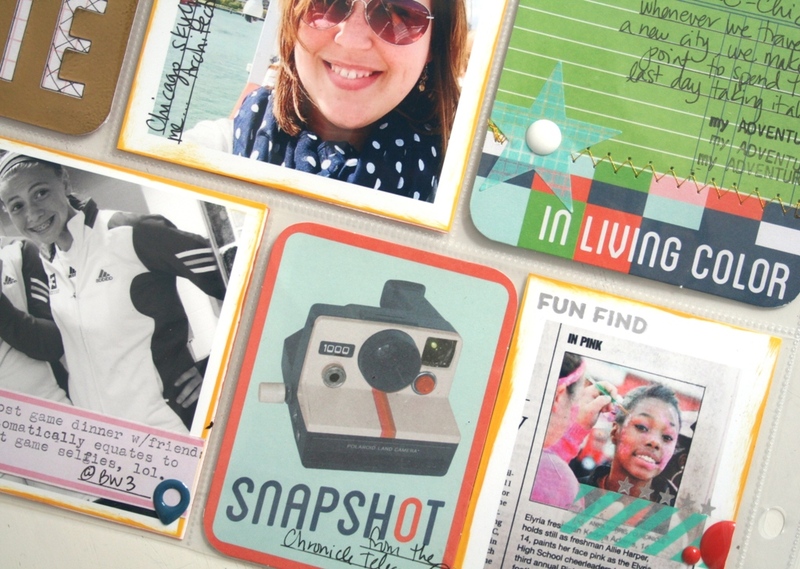 Using the letterpress is a fun way to add something extra to your Albums Made Easy layouts.